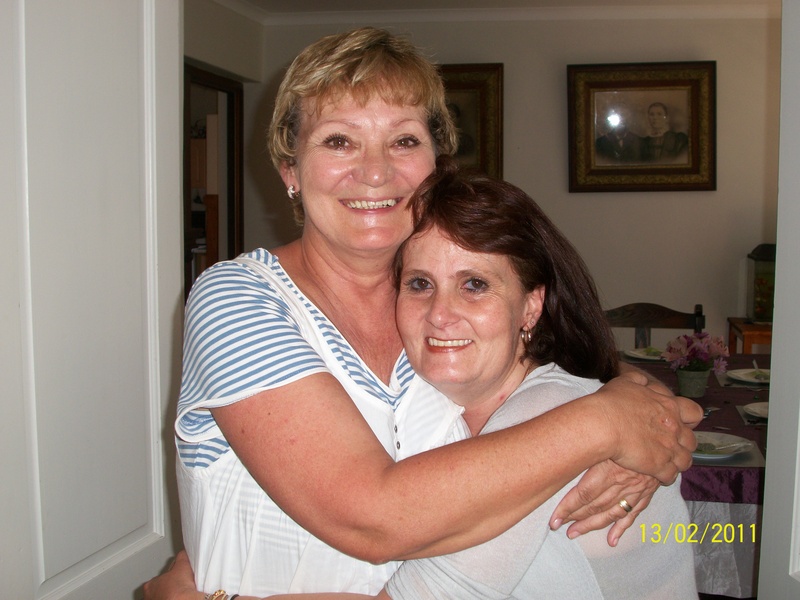 Posted on July 15, 2013 July 15, 2013 Categories A Mother's Grief, Angels, Death, Death of a child, Grief, Terminal Illness, Vicky BruceTags crying, death, Emotion, Grief, Grief Loss and Bereavement, Health, mourning, Vic15 Comments on I am Vic’s mother! These beautiful words moved me to tears. I cry easily these days. 100 days of searing pain…. Researchers say that a mother never ceases mourning the death of her child. I believe this finding. In those immediate hours, after my precious child’s death, time stopped. My life ground to a halt. I stood next to the hearse not wanting it to leave. I rested my hand on the wood of the casket…I wanted to pull my child out of that darn coffin and wrap her in my arms. I was not ready to say goodbye. Today it is 100 days filled with searing pain and longing since Vic left home for the last time. I have begun to mark time differently. I count the number of days, weeks and months that I have mourned and missed my child. I know that every day that passes is one day closer to me being with my beloved child again. 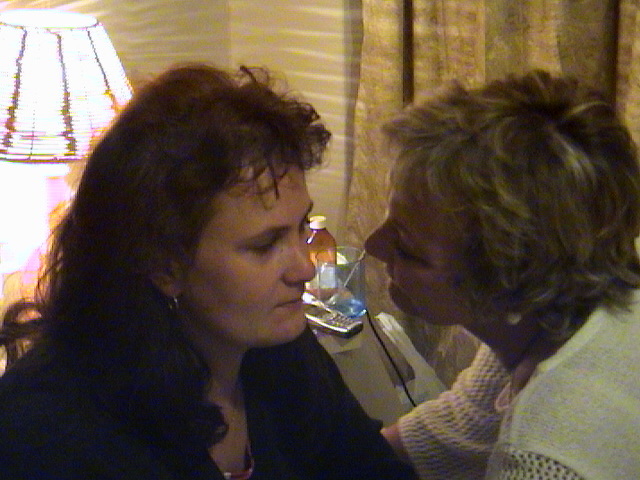 I know that Vic’s suffering is over; I know that it is for the best that Vic’s dreadful pain filled life is over…. It does not make my mourning less. So today I am burning candles for my child. I am praying that my child is at peace. I am praying for grace to endure this longing. I pray that I will have the strength to continue honouring Vic’s memory…. 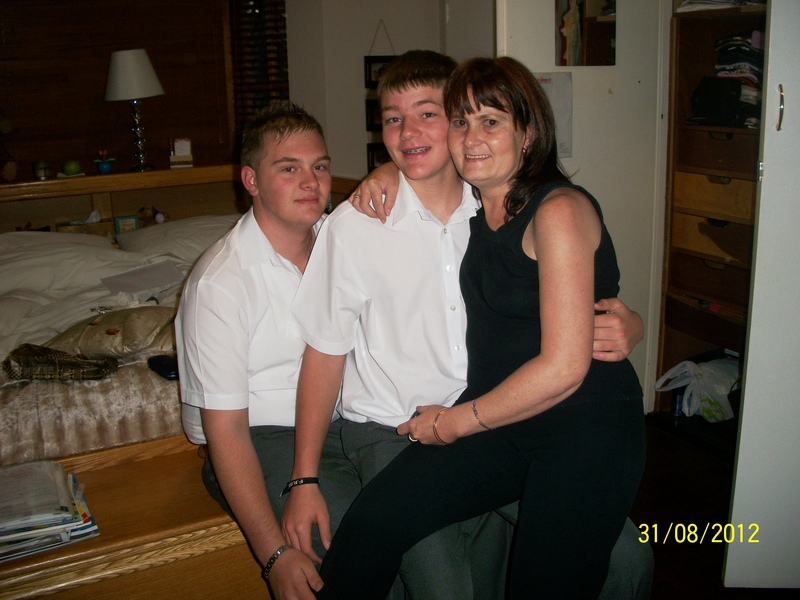 I pray that I will be worthy of the trust she put in me to look after her precious boys. On the surface it appears as if the boys are coping well. I heard a comment from a teacher this week saying that, despite the trauma they went through with Vic’s death this year, they are actually doing better than last year. It was so difficult watching her suffering! Posted on April 27, 2013 Categories Angels, Death, Death of a child, Family, Family Life, Grief, Palliative Care, Terminal Illness, Vicky BruceTags death, Family, Grief Loss and Bereavement, Health, Hearse, Mental health, mourning, rest in peace, Support group, Vic9 Comments on 100 days of searing pain…. Thursday we went to a famous wine farm, Spier. 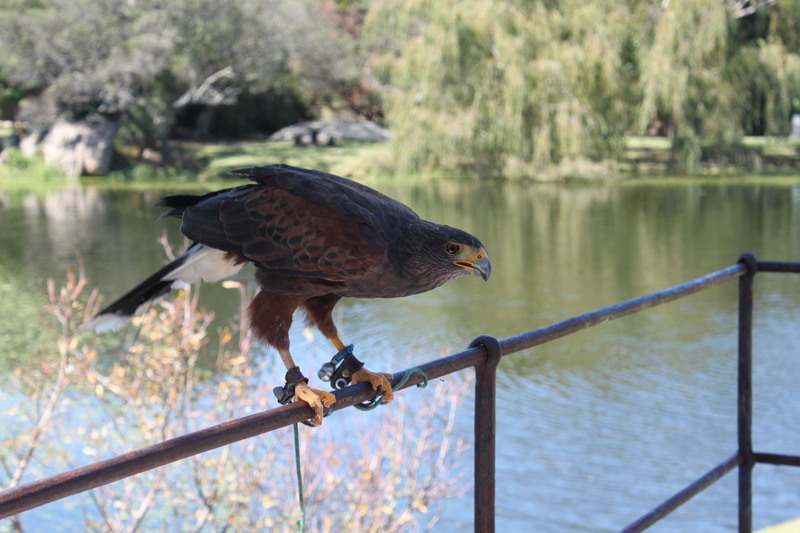 Spier has bird and cheetah sanctuaries. We wandered around and decided against the rather sophisticated meals served. We decided to find a coffee shop or boutique restaurant – something quainter than the rather commercial option available. We were fascinated by a beautiful falcon and even more magnificent looking owls. 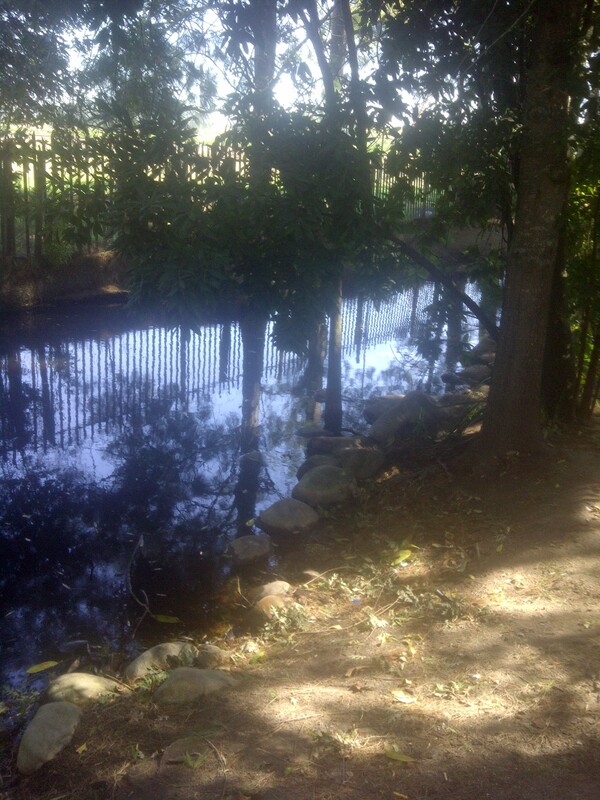 Spier is a wonderful place to visit. We left and decided to be adventurous and ignore the GPS. We drove in an unknown direction on the lookout for something quaint. 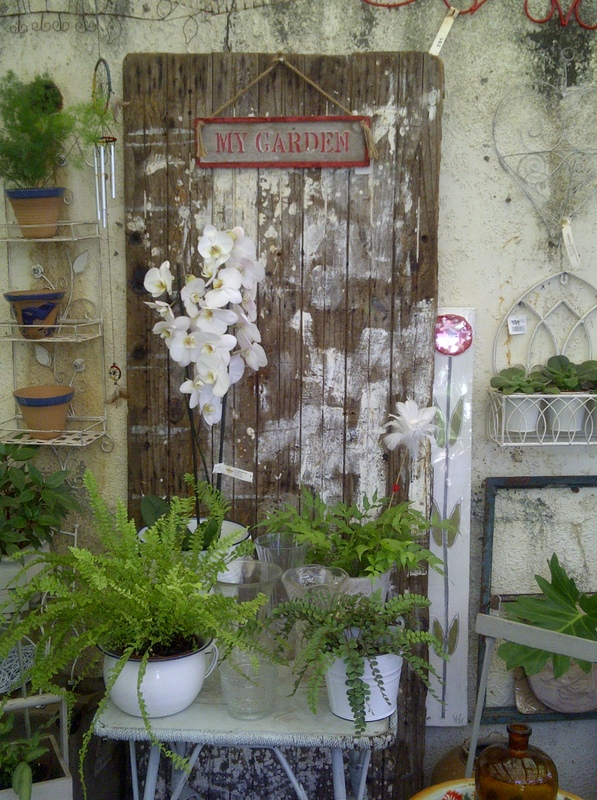 We drove for two kilometres when we found an interesting sign…Aspidistra Nursery and Tea Garden. We decided it sounded quaint enough. We had a delightful meal. It was so peaceful we just sat and chatted. WE spoke about how much Vic would have enjoyed the garden and how much we miss her. We exchanged funny stories about Vic and decided to have desert. 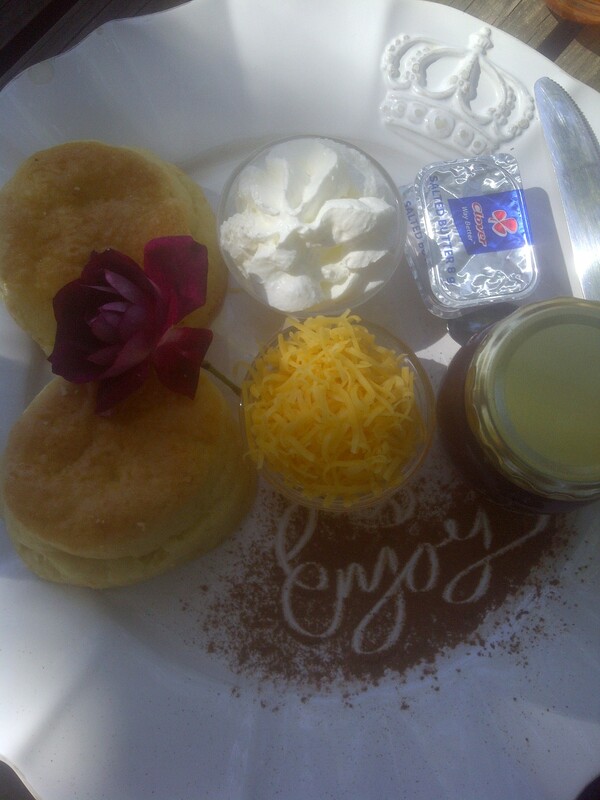 I ordered the scones (Vic and my favourite). The presentation of the scones was amazing! “You got your white feather Oumie!” Jared said. I must be honest that when I started looking there were white feathers everywhere. There were white pigeons sitting in the trees. 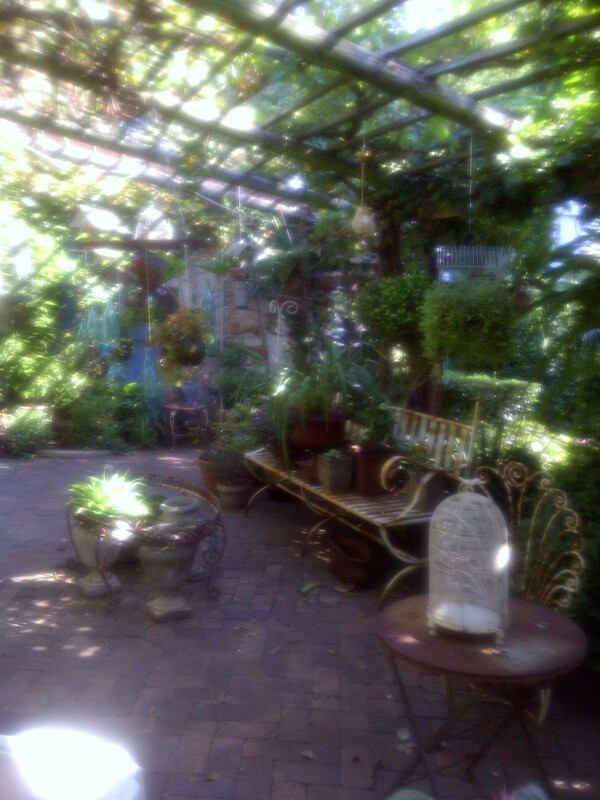 After our leisurely lunch we walked through the nursery part of Aspidistra and my wildest expectations were surpassed! It was beautiful. Plants and flowers were displayed in beautiful handcrafted containers; ribbons were swaying in the breeze. Then I saw it! 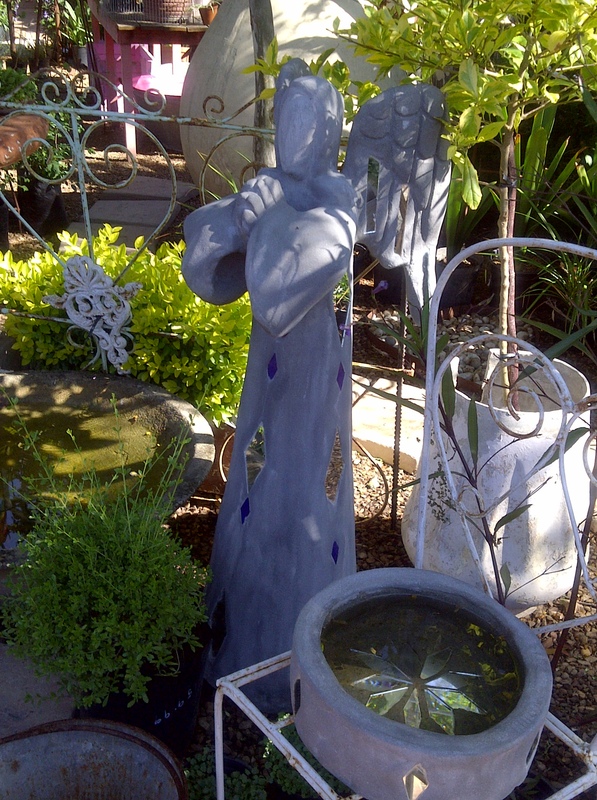 The perfect angel for Vic’s garden of remembrance! It is a handmade, one of a kind, angel – just like my angel child. Perfect – just like Vic! The angel is being couriered to our home next week. I desperately miss my little girl. I don’t want to be planning her Garden of Remembrance – I want to be planning our trip to Italy. I want to be having a cup of coffee with my child not putting an almost empty bottle of coffee in a memory box. Will I ever feel happy again? As I am typing I can hardly see the screen of my laptop. I cannot stop the tears. I cannot believe I ever thought it would be better for Vic to die… I cannot believe I have to face the rest of my life with this empty hole in my heart. I cannot bear the sorrow. I want to hold my little girl and hear her say “I love you Mommy”. Posted on April 2, 2013 Categories Angels, Death, Death of a child, Family, Grief, Osteogenesis Imperfecta, Religion in my world, Terminal Illness, Vicky BruceTags a mother's grief, death of an only child, loss of a child, Message from Angel, message from Heaven, mourning, tears1 Comment on A message from Heaven!